The Belize Barrier Reef is home to whale sharks, rays and manatees. 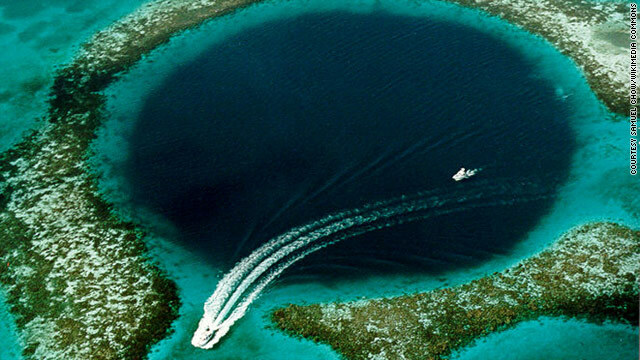 One of its most famous sites is the Great Blue Hole. (Budget Travel) -- You've heard the grim timelines: if warming continues, the Great Barrier Reef will be bleached by 2030; glaciers in the Swiss Alps, on Mt. Kilimanjaro, and in Glacier National Park will disappear in under 40 years; and Arctic ice melt will leave the North Pole bare and polar bears extinct. The immediacy of these timelines prompts flocks of curious eco-tourists to travel to environmentally fragile areas. Tourism is both bane and boon: it can add strain to already distressed areas, but it can also provide income, which in turn can help preserve these wonders. We spotlight 10 areas under threat -- some lesser known than others -- that can still be visited responsibly. In some cases the price tag may be higher than your average vacation, but consider it an investment in Mother Earth. Like the Great Barrier Reef in Australia, the Belize Barrier Reef leads a tenuous existence. A section of the nearly 700-mile-long Mesoamerican Reef that reaches from Mexico to Honduras, the Belize reef suffered a severe bleaching in 1998, with a loss of 50 percent of its coral in many areas, including much of its distinctive staghorn coral. Since the bleaching, its decline has continued, due to global warming of the world's seas, agricultural pollution, development, and increasing tourism, which has given rise to more coastal development and an invasion of cruise ships. At more than 1.3 million square miles, the Congo Basin has the world's second-largest rainforest, after the Amazon's. According to the United Nations, up to two-thirds of the forest and its unique plants and wildlife could be lost by 2040 unless more effective measures are taken to protect it. Extending across six nations, ten million acres of forest is degraded each year due to mining, illegal logging, farming, ranching, and guerilla warfare. Roads cut by loggers and miners have also enabled poachers and bushmeat hunters to prey on endangered animals like mountain gorillas, forest elephants, bonobos, and okapis. As the forest shrinks, less carbon dioxide is absorbed, and rain decreases, adding to climate change. In the last four decades, the Dead Sea has shrunk by a third and sunk 80 feet --13 inches per year! -- stranding formerly seaside resorts and restaurants nearly a mile from shore. The Jordan River is the lake's sole source, and as surrounding countries increasingly tap its waters, little reaches the Dead Sea, which could disappear within 50 years. Further pressure is put on the sea by the cosmetic companies and potash producers who drain it for minerals. One proposed solution is the controversial Red-Dead Canal, channeling water 112 miles from the Red Sea, but its environmental impact could be negative (some worry that it would increase seismic activity in the region). A host of dangers are putting this fragile wetland at risk: pollution from farms, invasive species, and encroaching development, not to mention the fact that 60 percent of the region's water is being diverted to nearby cities and farms. As a result, The Everglades is now half the size it was in 1900. Worse, this is the sole habitat of the Florida panther, and there are less than 100 of the creatures left in the wild. These big cats may be completely lost within the next 40 years as their habitat disappears (they're not alone, either -- at least 20 species in the Everglades are endangered, including turtles, manatees, and wading birds). If nothing is done to save the world's fourth-largest island, its forests will be gone in 35 years (once 120,000 square miles, they're now down to 20,000), and their unique inhabitants along with them. Forest ecosystems are being destroyed by logging, burning for subsistence farms, and poaching. The 20 species of lemurs for which Madagascar is renowned are in danger of disappearing. Though there are game reserves, they're not large (occupying only 5% of the island), nor are they contiguous, thus failing to provide corridors for the animals to travel through. Some of Madagascar's endemic species have never even been recorded, and will likely be lost before they can be studied. Few scientists hold out much hope for the Maldives -- the world's lowest nation -- if global warming continues to melt the ice caps and raise sea levels. Its 1,190 small islands and atolls (200 of which are inhabited) scattered across the Indian Ocean rise a mere eight feet above sea level. In 2008, the President of the Maldives announced the government would start buying land in other countries, including India, for future homes for citizens displaced by rising waters. In 2009, he held a cabinet meeting underwater to stress the islands' vulnerability. The Woods Hole Oceanographic Institute, the world's largest non-profit ocean research group, has predicted that 80 percent of the emperor penguin population of Antarctica will be lost, and the rest in danger of extinction, if global warming continues. In the Arctic, the polar bear is also endangered by the steady loss of sea ice (which has decreased 3% per decade since the 1970s). As sea ice disappears at the poles, so do entire ecosystems: the phytoplankton that grows under ice sheets feeds zooplankton and small crustaceans like krill, which are on the food chain for fish, seals, whales, polar bears and penguins. Studies predict that with continued warming, within 20-40 years, no ice will form in Antarctica. Their habitats have been reduced 93%, and though there are reserves across Asia, most are small and have no corridors between them for the normally far-roaming felines. It's estimated that a tiger a day is killed for use in Chinese traditional medicine. This magnificent rain forest in Peru's Madre de Dios region holds some of the last old-growth stands of mahogany in South America. But illegal logging is depleting the rainforest -- and the U.S. is responsible for buying 80% of the mahogany. A single tree can create as much as $1 million worth of furniture. Loggers build roads, allowing farmers and hunters to enter, further crowding the indigenous people and destroying the delicate ecosystem. In nearby areas, gold mining has released mercury into the air and water. It's too early to know the exact impact of the creation of China's massive, $24 billion Three Gorges Dam, but many, including the Chinese government, have acknowledged that the Yangtze Basin region is in danger of losing its most distinctive marine and animal life. Deforestation has occurred from clearing land for displaced farmers, and the reservoir has flooded villages, farms, factories, and mines, adding to the Yangtze River's existing pollution from shipping, industry, agriculture and raw sewage. Landslides have also happened, and seismologists wonder if the water pressure above two fault lines might result in a disastrous earthquake.